The graphs below provide a summary of the herbicide resistance status of ryegrass in Western Australia for the herbicides listed. For a high resolution version, please click on the graphs below. For detailed survey information on individual cropping zones, please click here. In 1998, a random survey of 264 cropping paddocks in the West Australian (WA) wheatbelt was conducted to determine the extent of annual ryegrass populations that were resistant to commonly used ALS and ACCase inhibiting herbicides. This was the first survey of its type conducted in WA. Annual ryegrass density was also assessed and, where present, a representative seed sample collected. Populations were tested for resistance to diclofop, clethodim and chlorsulfuron and the results revealed high levels of resistance to ACCase and ALS herbicides across the wheatbelt (Llewellyn and Powles 2001). Five years later, a larger 500 paddock survey conducted at the end of the 2003 growing season over harvest (November and December), determined that resistance to ACCase (Group A) and ALS herbicides (Group B) had increased to high levels of resistance during this five year period (Owen et al 2007) across 15 agronomic zones in the WA wheatbelt. Importantly, this survey identified low level but developing resistance to the ACCase herbicide clethodim. The survey confirmed that triazine herbicides continue to provide control of most ryegrass populations, as does trifluralin, although a worrying sign is that many populations had a small number of trifluralin resistant plants (Owen et al 2007). In this random survey, almost all populations remained susceptible to glyphosate. The latest survey (2010) was conducted to assess the current state of herbicide resistance to commonly used herbicides in the WA wheatbelt, for five important weed species. While previous surveys had been done randomly and anonymously, the 2010 survey has engaged grower participation; however, paddock selection within properties was still random to allow comparison with the previous data on resistance occurrence. Grower engagement also allowed farmers to receive individual results for their paddocks used in the survey. Over 15, 000 km were travelled, extending from Binnu in the north of the State, to Esperance in the south. In total, 466 paddocks were visited in which mature seed heads from 362 samples of ryegrass populations were collected at harvest. During the 2011 growing season, annual ryegrass seedlings were screened for resistance to commonly used herbicides including clethodim, trifluralin, diclofop-methyl, sulfometuron, atrazine, paraquat and glyphosate at recommended field rates. 65% of populations contained plants resistant to clethodim at the 250ml label rate, while a further 42% of populations also contained plants resistant to clethodim at the higher label rate of 500ml/ha. 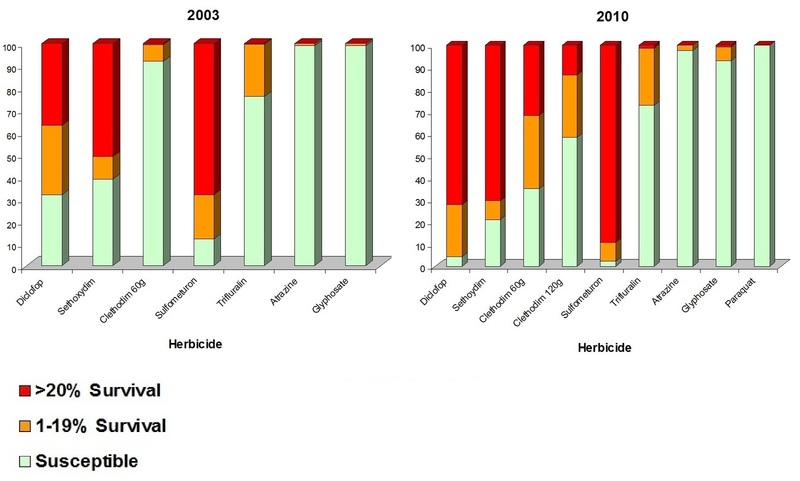 Herbicide rates used during resistance testing for samples collected during the 2003 and 2010 surveys. Note that for the 2003 survey, the label rate for Select® (clethodim) was 250 mL/ha. During resistance testing for samples collected during the 2010 survey, the label rate changed to 500 mL/ha. In 2010, the old rate was used for comparison with the 2003 results, and the new rate was also tested to reflect the current situation. Owen, M.J. and Powles, S.B. (2010) Glyphosate-Resistant Rigid Ryegrass (Lolium rigidum) Populations in the Western Australian Grain Belt. Weed Technology, 24, 44 – 49. Llewellyn, R.S., D’Emden, F.H., Owen, M.J., Powles, S.B. (2009) Herbicide resistance in ryegrass (Lolium rigidum) has not led to higher weed densities in WA cropping fields. Weed Science, 57, 61-65. Owen, M.J., Walsh, M.J, Llewellyn, R.S. and Powles, S.B. (2007) Widespread occurrence of multiple herbicide resistance in Western Australian annual ryegrass (Lolium rigidum) populations. Australian Journal of Agricultural Research, 58 (7), 711-718. Llewellyn, R., Powles, S.B. (2001) High levels of herbicide resistance in rigid ryegrass (Lolium rigidum) across the Western Australian wheatbelt. Weed Technology, 15, 242-248.